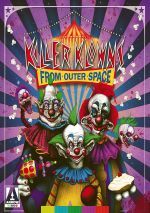 A comedic homage to 1950s horror flicks, 1988’s Killer Klowns from Outer Space takes us to small town Crescent Cove. While on a date, Dave Hanson and Debbie Stone see a shooting star that lands in the nearby woods. When they investigate, they discover a spaceship that resembles a circus tent as well as aliens that look like clowns. These goofy extra-terrestrials start to kill townsfolk, so a few locals try to combat the threat. On the surface, that sounds like a decent idea for a movie. Of course, a movie called Killer Klowns from Outer Space inevitably will push for as many laughs as scares, but in the right hands, such a tale could succeed. Best-known as stop-motion effects artists, Klowns represented the first – and to date only – film written and directed by the Chiodo brothers. Stephen directed, he and Charles wrote the script, and Edward handled production design. The Chiodos’ background makes the ups and downs of Klowns somewhat predictable. While the film does well in terms of its effects and technical elements, it struggles to stay together as a vivid narrative. Even given its relative age, the visual parts of Klowns still look pretty good. The title characters seem fairly effective, and a mix of other tidbits are fun and well-rendered. The Chiodos also imbue the aliens with plenty of clever conceits. Their technology takes on a circus-oriented vibe – like a gun that shoots deadly popcorn and such – and these choices amuse. How can I dislike a movie in which a balloon animal acts as a “tracking dog”? As delightful as these clown-related elements may be, the Chiodos falter in other areas. Largely a conglomeration of influences like Invasion of the Body Snatchers and The Blob, Klowns becomes an essentially plot-free affair, one without much narrative movement. The charm that comes from the effects and clown concepts carries us a long way, but the absence of interesting characters or a coherent plot becomes an issue. We may take fun from the visual material but they only go so far. It doesn’t help that the Chiodos falter when it comes to basic filmmaking techniques. Klowns becomes awkwardly constructed, with scenes that run too long, like no one said “cut” and the actors needed to vsmp. Klowns also suffers from other technical insufficiencies. We find a strange sense of blocking and movement. At times, characters seem to pause before they act, as though they try to remember what to do. Outside of a moderately fun turn from John Vernon, the acting becomes another problem. The performers can’t handle the comedy or the action, so they almost uniformly feel amateurish and they create another flawed side of the film. More of a collection of random comedy/horror sequences with a vague theme attached, I enjoy parts of Killer Klowns from Outer Space. Unfortunately, it’s better as a reel of fun visual effects elements than as an actual movie. Killer Klowns from Outer Space appears in an aspect ratio of approximately 1.85:1 on this Blu-ray Disc. I felt pleased with this largely solid presentation. For the most part, sharpness appeared positive. A smidgen of softness occasionally interfered with wide shots, but those issues remained minor, so the movie usually appeared distinctive and detailed. The image suffered from no problems with jagged edges or shimmering, and it also lacked edge enhancement. Grain remained appropriate, and the image showed no print flaws. Colors came across as very good. The film utilized a fairly broad palette, and the Blu-ray replicated those tones with accuracy and vivacity. Blacks seemed similarly tight, and shadows showed reasonable clarity. This was a consistently appealing transfer. The film’s DTS-HD MA 5.1 soundfield usually stayed with a forward bias. In that realm, elements were accurately placed and meshed together pretty nicely. Audio quality continued to seem strong. Dialogue could be a little edgy at times, but given its age, speech felt reasonably natural and concise. Effects sounded pretty tight, with surprisingly good impact. Music also showed nice presence and range. Nothing about the mix floored me, but it worked well for a movie of this one’s vintage and budget. Among the set’s extras, we begin with an audio commentary from writer/director Stephen Chiodo, writer Edward Chiodo and production designer Charles Chiodo. 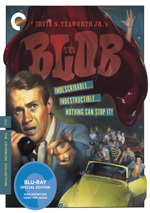 Recorded for a 2001 DVD, all three sit together for a running, screen-specific look at story/characters, locations and production design, effects, music, cast and performances, and challenges related to the movie’s low budget. Though this never becomes a scintillating track, the Chiodos seem affable and honest enough to make it enjoyable. They cover a pretty good array of topics and allow this to turn into a useful commentary. A few featurettes follow, and we start with Let the Show Begin!, a 10-minute, 38-second piece with musicians Leonard Graves Phillips and Stan Lee. They tell us a little about their band the Dickies as well as their work on the theme song. We get a good selection of insights from the rockers. For a look behind the scenes of the Chiodo brothers’ early work, we go to The Chiodos Walk Among Us. It goes for 23 minutes, 41 seconds and delivers comments from Stephen Chiodo, Charles Chiodo, and Edward Chiodo. As expected, they tell us of their youthful interest in films and take us through many of their early efforts. We get a good impression of their roots in this engaging and informative piece. Under Chiodo Brothers Early Films, we find six of those efforts. This collection includes 1967’s Land of Terror (7:38), 1968’s Beast from the Egg (7:26), 1970’s Africa Danny (16:58), 1971’s Eskimo (7:03), 1972’s Sludge Grubs (6:54) and 1974’s Free Inside (12:20). We already see some of this material in “Walk Among Us”, but it’s great to watch the movies in their entirety. Of course, they’re primitive, but given the Chiodos’ youth and resources, I find the results to seem pretty impressive. We can view Beast with or without commentary from the Chiodos. They offer some basics about the short but don’t give us a lot of insights. Next comes a 2014 reel called Bringing Life to These Things. It goes for seven minutes, 58 seconds and features Stephen Chiodo as he gives us a tour of Chiodo Bros. Productions. The show intermixes archival footage from the Klowns shoot and a glimpse of the Chiodo archives. This turns into a fairly enjoyable view behind the scenes. Under Killer Interviews, six segments appear. “Tales of Tobacco” (18:01) features actor Grant Cramer, “Debbie’s Big Night” (10:39) offers actor Suzanne Snyder, “The Making of Killer Klowns” (21:40) includes the Chiodo brothers, “Visual Effects” (14:52) brings Charles Chiodo and visual effects supervisor Gene Warren Jr., “Kreating Klowns” (12:50) delivers Charles Chiodo and creature fabricator Dwight Roberts, and “Komposing Klowns” (13:15) involves composer John Massari. As expected, the first two offer the actors’ perspectives on the shoot, while the rest – all from the 2001 DVD – go over various filmmaking elements. Some include plenty of behind the scenes shots, and “Making” gives a glimpse of the film’s original opening. Considered as a package, these offer a lot of good information. Plenty of new tidbits emerge, and the vintage footage adds value as well. Behind the Screams with the Chiodos lasts 29 minutes, 54 seconds and presents raw video clips from aspects of the production. This means any narration comes from the original material, so no new commentary appears. That works fine, as the circa 1987 thoughts seem satisfying. We see a location scout, aspects of effects creation, and parts of the shoot. This turns into a fun compilation of behind the scenes footage. After this we find three minutes, 56 seconds of Klown Auditions. We see performers as they work through acting in the massive klown suits. This delivers another useful batch of archival shots. Two Deleted Scenes follow. “Bad Experience” (2:14) lets Debbie tell us why she doesn’t like clowns, and “Tight Rope” (2:22) offers a little more action during the film’s climax. “Experience” seems largely pointless, but “Rope” brings a moderately fun sequence. We can view the scenes with or without commentary from the Chiodo brothers. They deliver some basics but don’t offer a lot of concrete information. A collection of Killer Bloopers runs two minutes, 49 seconds. It’s a pretty standard allotment of goofs and giggles. Under Image Galleries, we locate four domains: “Stills” (26 images), “Behind the Scenes” (125), “Concept Art” (84) and “Storyboards” (170 across 8 domains). All provide nice elements, though “Concept Art” becomes the most satisfying. In addition to the film’s trailer, the package concludes with a booklet. It offers a mix of art, credits and an essay from film critic James Oliver. The booklet finishes the set on a good note. Despite some good effects and a few clever elements, Killer Klowns from Outer Space doesn’t hang together as a movie. It lacks consistency and only sporadically entertains. The Blu-ray presents generally positive picture and audio along with a strong collection of supplements. Fans will enjoy this release, but I admit the film doesn’t do a lot for me.